Don Hull Spey casting for fall steelhead on the lower Deschutes. The rugged beauty of lower Deschutes River looking north across the Columbia River toward the distant windmills in Goldendale, Washington. Eric Neufield with a beautiful Chinook salmon, which occasionally take steelhead flies. The dinning tent at one of Larimer Outfitters’ 3-7 day steelhead camps. 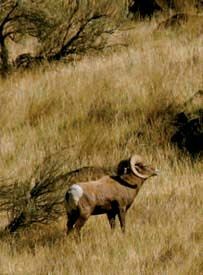 Bighorn sheep, part of a herd in Deschutes River Canyon. Classic "Hairwing" style steelhead flies. Jeremy Hull with a 10 lb Deschutes River wild summer steelhead. Judith O’Keefe in prime water during the spring salmon fly hatch. Rods leaning against a birdhouse during an Emerald Water Angler camp – a good selection never hurts. October Caddis, one of the reasons steelhead love surface flies, especially in the fall. 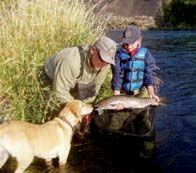 Fly Fisher’s Place guide Steve Erickson helps a young client with a steelhead to remember. 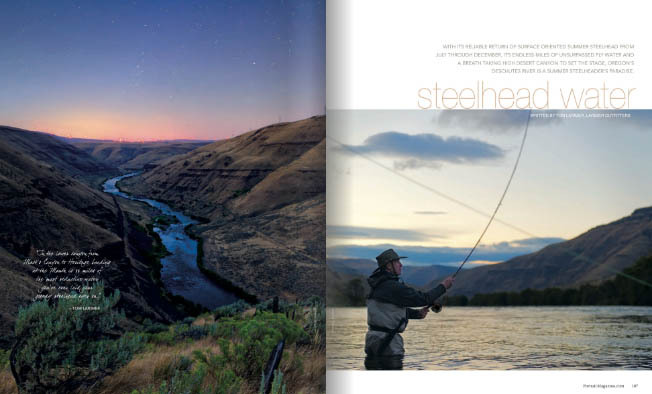 In his original release Fifty Places to Fly Fish Before You Die, fly fishing expert and author, Chris Santella, places the Deschutes on his list of the world’s greatest destinations (©Tabori & Chang). 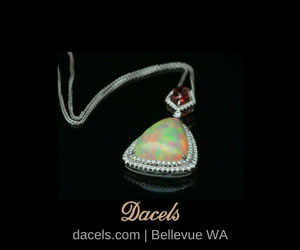 One of the renowned Redsides of the Deschutes, hard fighting, beautiful and a native species of the region. Al Bagley and his staff book well in advance, so call ahead. 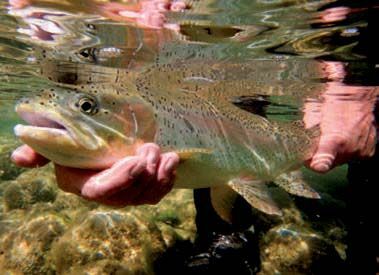 Fly fish for "native" redside rainbow trout year round. Prime steelhead sea-son is mid September through December. 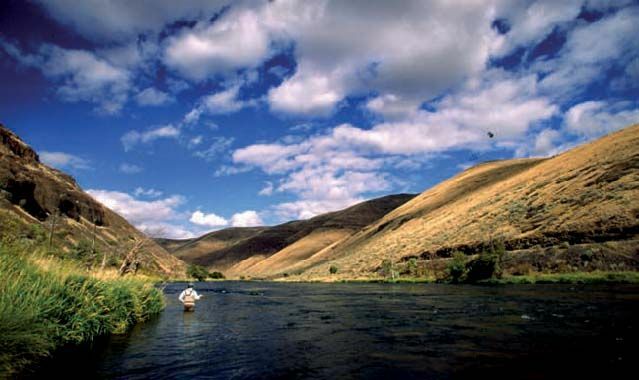 All you’ll need is an Oregon fishing license, a Confederated Tribes of Warm Springs (CTWS-2) special permit (www.tribalpermit.com) and your tribal guide to fish the west side of the Deschutes. For more info, visit www.fishtherez.com. The Deschutes begins her journey at Little Lava Lake, some 150 miles south of its final destination: the Columbia River. The river is a tail water, impeded by two dams which steel-head cannot ascend. 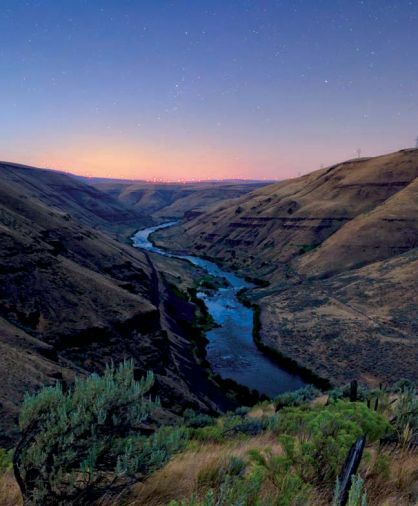 Flowing from south to north, the river cuts its way through an immense basalt canyon. Wildlife is abundant. It’s not uncommon to see bighorn sheep, black tail deer, otter, and mink during a day of fly fishing. Golden eagles soar on the rising thermals, while a wide variety of birds can be seen and heard closer to the river. Make no mistake, this is rattlesnake country. While Deschutes rattlers are docile, they too, are part of the experience. The river’s flora changes depending on where you are in the system. On the upper river near Warms Springs you’ll see ponderosa pine and cedar. As you move down river, white alder and blackberry command the river banks. There is a feeling the Deschutes gives you. It’s a river that can be totally inviting, and yet completely intimidating at the same time. The high desert country is so barren, when you’re on the "D", it feels as though you’ve stopped the clock, and stepped back in time. In the lower canyon from Mack’s Canyon to Heritage Landing at the Mouth is 23 miles of the most seductive water you’ve ever laid your greedy steelhead eyes on. This is a big, brawling river, averaging 7,063CFS in the lower river during the steelhead season. Wading staffs and studded boots help negotiate the boulder filled runs and swift current. Steelies start showing up in the beginning of July and continue entering the river into January some years. This stretch has no road access other than a death trap single track called the road to Kloan. (If you like your car, don’t even think about it.) Consequently, the best way to access the lower river is via jet sled. This stretch is also a great three-day float trip in a drift boat or raft. The river is closed to motorized vehicles every other weekend from Thursday to Sunday to give floaters a chance to fish without sleds. However, boaters take caution. The lower river is guarded by five major rapids and numerous small but tricky pieces of white water. This is not a place to cut your teeth on the oars or to learn how to run a sled. Boats sink on a regular basis. Boaters are not allowed to fish the water from rattlesnake rapids down to Heritage Landing. This gives those on foot three miles to fish without competition from boats. What makes the lower river so unique is that it attracts many fish destined for other Columbia River tributaries. As the steel-head ascend the warm Columbia, the cooler Deschutes invites them in for a break from 70 degree water. Many of these "strays" will go 15 miles up the Deschutes. This can drastically inflate the number of fish in the lower river. From Mack’s upriver to the locked gate is considered the Maupin stretch. Maupin is a small town roughly 50 river miles up from the mouth. 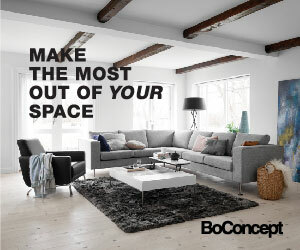 This stretch offers the best walk-in access. 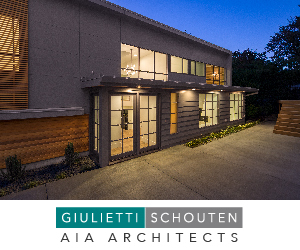 The Deschutes River Access Road parallels the river for more than 35 miles. Outside of the water between the White River to just below Shear’s Falls, the Maupin area offers some beautiful steelhead water. A number of great day floats exist in this stretch. While the water from Wapinitia boat ramp to Sandy Beach boat ramp is legitimate class III/IV white water, most of the other floats are class II. Don’t be fooled by the rating though, this is still big water! For those looking to car camp, the lower access road has some great spots to pitch a tent. Be prepared to fight the crowds during the peak season of August through October. Etiquette is a must for everyone to get along. Luckily, most Deschutes junkies follow the code like religion: Start at the head of the pool, step down river between casts, relinquish your spot if you hook a fish, and never, EVER, take two steps downstream of someone in a piece of water. Even if it’s 200 yards long. Period. From Nina Creek boat ramp up to Trout Creek is considered the upper river. The steelhead don’t start showing up in big numbers until September. When they do show, it makes for a wonderful three-day float. However, the west side of the river is mostly the Warm Springs Indian reservation. Because it is closed to angling without a CTWS-Approved Tribal Guide, most of the fishing pressure is on the east bank. Again, it cannot be stressed enough that this is not a river for beginner rowers. White Horse Rapids is known for taking both boats and lives. Mandatary scouting! With little drive-in access, this stretch is almost exclusively for boaters. Make sure you give yourself time to find a campsite on this float. 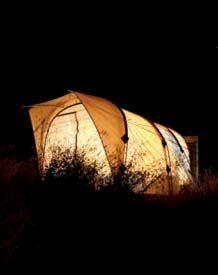 While many great campsites exist, the prime spots go quickly. From Trout Creek boat ramp up to Warm Springs boat ramp is a great late season day float. There is walk-in access at Mecca flats and South Junction. Fishing in the upper river gets decent by late September and continues through December. The Deschutes is a classic Spey river. Her massive boulder filled runs are often lined with alder and black-berry. Back casting is almost always an issue. Because most Deschutes steelhead are one salt fish averaging 5 to 7 pounds, 6 and 7 weight Spey rods are the tool of choice. With that said, remember those stray fish? Twenty pound plus fish are landed in the lower river on a frequent basis. Bring at least a 7 weight if you’re headed to the lower river. What makes Deschutes fish so unique is their un-abashed addiction to surface or near surface flies. Floating lines are standard operating procedure when the shade is on the water or during heavy overcast days. Once the sun is high above the canyon’s rim, you can still catch fish on floating lines provided you can get a good angle to the sun. This can be tough considering the river runs from the south to the north. With that said, fish can be found during the mid-day using sink-tips and big flies. If you like catching chrome bright rockets on dry flies in a beautiful setting, you owe it to yourself to fish the Deschutes this year. A day on the Deschutes fly fishing for steelhead is about as good as it gets. My father and I went out on the Warm Springs (west side) of the river with tribal guide Al Bagley, who has been hosting clients on day trips for over 15 years. We came in the night before, and by early light, we were on the river, decked out in all our gear, waiting for that first strike. Compared to my sometimes hectic life publishing Portrait Magazine, this was heaven. 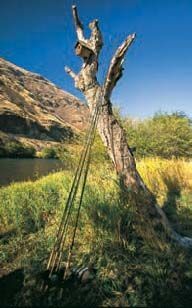 No phones, no stress, and actually no people – we were fishing along the Warm Springs side of the river, which requires a special permit. For my dad and I, fly fishing is our thing. We don’t talk. We just be. It’s peaceful and yet we’re on a mission for the day. With Al quietly maneuvering us into the best positions along the river, we knew we had a shot. Yes, it’s science and skill, and you need the right fly and presentation, and of course the fly needs to land perfectly upstream and drift slowly by….slowly…slowly…until…any takers? Okay, cast again. And again. And so it went throughout the day. Patience. With incredible scenery and wildlife all around. While tying the flies on my leader, Al was a fountain of rich lore and heritage, about the river and the reservation. A good guide knows the river, but a great guide can put it all into context across generations. His clients come from all over the world, certainly some are quite fa-mous, but he won’t ever tell. The only thing that matters is the quest at hand. It’s a day on the river for new friends and old. And yes, the many fish – the kind you write about. 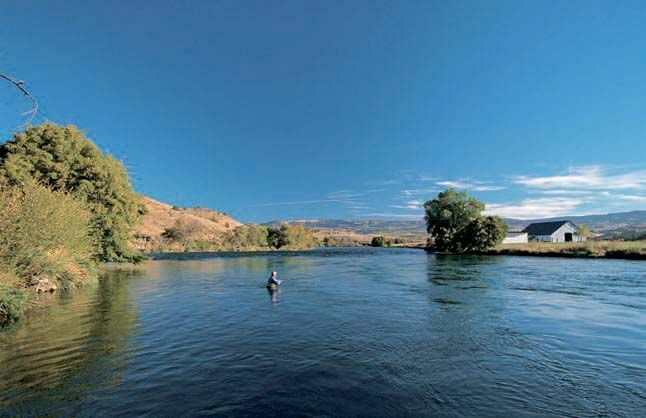 The Deschutes River produces world-renown steelhead runs of both wild and hatchery fish. The steelhead season traditionally starts mid July and continues on through December on the lower river, the prime time being mid August through October. Guided steelhead camps & float trips provides an excellent opportunity to catch these amazing fish. 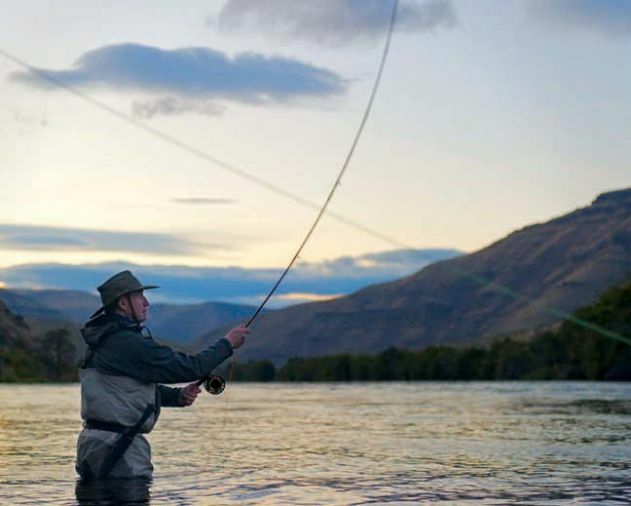 Based in Hood River, Oregon, Larimer Outfitters offers guided fly fishing trips for steelhead and trout on Oregon’s Deschutes River, Clackamas River and Hood River. Specializing in spey casting and fishing with an ever-present emphasis on teaching during guided trips. Larimer’s private spey casting lessons are highly respected. 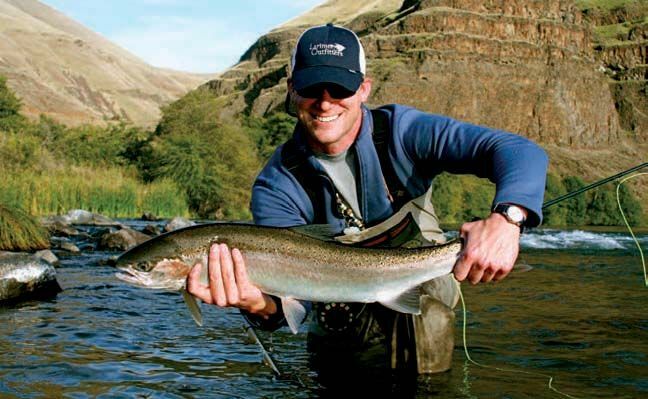 With over 15 years of guiding experience, jet boat access to best runs and arguably the finest accommodations on the river–Larimer Outfitters Deschutes River Steelhead Camps are a great choice for your next fly fishing adventure! 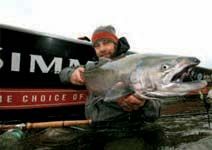 If you are headed to the greater Seattle area and want to fly fish, Emerald Water Anglers are the most comprehensive resource for guiding and fly fishing instruction in the region. Offering the widest array of Seattle based trips for the novice and expert alike. Multiple day drifts on the lower fifty miles of the Deschutes provide access to some of the most gorgeous riffles and runs a fly fisher might imagine. Local “home water” guides Brian Silvey and Ted Neely provide access for the Deschutes trips. 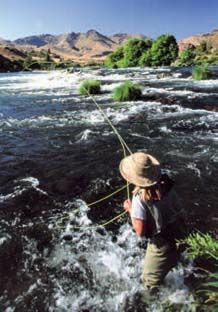 River Bend Guide Service provides Indian-guided fly fishing trips on Oregon's spectacular Deschutes River. 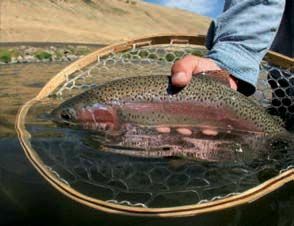 You will have exclusive access to private tribal water for fall steelhead, and "native" redside rainbow trout year round on the beautiful Warm Springs Indian Reservation of Oregon. Offering both drift boat and road-access trips along this amazing 22-mile stretch of river.